The 2009 calendar from Metta.org.uk has been improved and updated this year and now includes the New Moon and Full Moon Phases. It can be printed on virtually any printer. Simply download and print it! What you will need to produce your free calendar. 1) A Hole Punch! Or a sharp object to make two holes at the top of your calendar. 2) A treasury tag or a short piece of string tied through the holes. 3) Somewhere to hang your Free 2005 calendar. 4) Some paper, standard or HQ satin A4 paper. If you have some quality glossy, satin or plain A4 paper and a colour printer you will get the best results. However, a standard ink jet or laser printer with standard plain paper will produce the calendar for you. Please drop us an email and let us know how you get on and any suggested improvements for next years calendar. 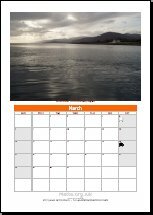 You can also order a printed and bound copy of the 2009 Calendar by sending an Feedback to Metta stating the number of copies required at £7.99 each plus P&P with your name, address and contact telephone number.